Samples from Dobermans diagnosed with cancer, cardiomyopathy and/or wobblers are needed NOW for a new, well funded research program pursuing genetic markers for these diseases. There is NO COST to owners for submitting samples and ALL SAMPLES WILL REMAIN COMPLETELY ANONYMOUS. The past year has witnessed remarkable advances in canine genetics including the launch of new molecular tools for elucidating the complete genetic code of an individual dog. Scientists at the Translational Genomics Research Institute (TGen), in collaboration with those at the Van Andel Research Institute (VARI), are employing these advances to accelerate research into the basis of devastating diseases affecting both canines and humans. There is presently seven figure funding, technological infrastructure and collective expertise to enable the rapid completion of canine genetic research projects in a matter of months as opposed to years. TGen/VARI have requested samples to pursue study of Doberman breed associated 1) cancer, 2) cardiomyopathy and 3) wobblers. IF sufficient numbers of DNA samples from affected Dobermans are received, initial results of research may be reported as early as at this year's National. For each of the following types of cancer, 10 affected Dobermans each are needed to submit samples: lymphoma, osteosarcoma, hemangiosarcoma, melanoma and malignant histiocystosis. This is an unprecedented opportunity for the Doberman Pinscher community to step up and help researchers address major health problems in our breed. Dr. Mark Neff (TGen/VARI) is on schedule to speak this October at National. He indicates he would be particularly enthused if he could present some successful findings on one or more breed associated diseases at that time. We all KNOW there are more than 40 Dobermans afflicted with each of these diseases out there. The greater the number of specimens received, the greater the accuracy of research findings. Please let's avail ourselves of these cutting edge research programs toward improving the health of our breed- the funds will not be there forever! PLEASE, take a few minutes to participate *For the Love of Dobermans*!! 1. Occult OR actual clinically affected DCM dogs are both needed, simply note which stage your dog is in on the form they send you. dogs. If that changes in the future I will certainly post. confidential, and highly motivated researchers with excellent funding, interested in several Doberman diseases! 1. Blood samples are also very desirable from dogs diagnosed with any of the above conditions (desirable but not required). If you are willing to take the extra step of providing a blood sample from your dog, the Institutes will reimburse your veterinarian $10 for the blood draw procedure AND provide you with a FedEx account number to completely cover the cost of shipping the sample in. Simply indicate when you contact Elissa that you need the info. on how to submit a blood sample. 2. Dogs diagnosed with more than one of these diseases ARE eligible to participate; owners should simply note this on the submission form. Also, if your dog has other health issues besides these three conditions they too can participate. ***SPECIMENS FROM DOBERMANS DIAGNOSED WITH CANCER, DCM (clinical/symptomatic OR occult), WOBBLERS NEEDED NOW! Yes. A Study for the 3 Big C's. This is awesome news!!!! 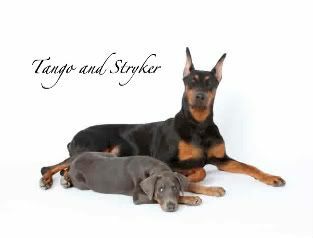 Dogs Name: Min-Pin: RIP Duchess,Mini Schnauzer: Jack,Dobe: Foxfire's Take'n By Surprise "Sabrina"
There is a 4 1/2 month blue female on the Distinguished Doberman Rescue site that has Wobbler's. I believe Dragonflyz volunteers there. I will also give this post to my vet because she has a large doberman clientele. I just opened my DPCA email murreydobe....and thought how wonderful to have more research for our babies! Let's pray with all these samples of diagnosed dogs, they are able to pinpoint the dna culprit asap! ***Maybe have a mod add to the title...samples needed from wobbler, cardio and cancer stricken dogs now! I don't suppose they could use hair samples from deceased dogs, could they? Sounds like they need saliva and/or blood samples. Just to clarify, I'm not sure why the OFA database is brought up in the original post, because she does NOT want to access this database and wants her own collection of DNA, so while I have already updated OFA with the diseases that my dog they have banked is afflicted with, she will still want her own separate sampling taken. Has anyone that has contacted the study received a response? I had emailed her on 6/10/2010 and have not heard a response. AKC GCH/U GCH/Int'l Ch. Rolin's Aurora Australis " Savannah"
Genesis Travelin' Man - "Hunter"
Genesis Learning to Fly "Raven"
Yes, I emailed her and got a few responses. I'm currently waiting for my kit - as are some other people I know. If you haven't gotten a response, I'd email again. Here's an update email. Note that they've opened research to add a fourth disease, so now need 40 dna samples from dobermans who've been diagnosed with liver disease. Since Razzle falls into that liver disease category, I'll be contacting them tomorrow to get a sample kit, so we can do our bit. Here are some important updates to the recent call for saliva/blood samples for DNA research on Doberman diseases. 1. A fourth breed associated condition has been included for DNA research if sufficient specimens are received. 40 samples (saliva, or blood *if* owners are able) from dogs afflicted with Doberman liver disease are needed to undertake DNA evaluation of this disease. 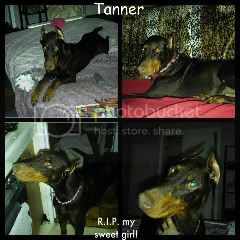 It is hoped that Dobe owners will be as forthcoming for this condition as they are being for DCM, wobblers and cancer. 2. Some have asked if there is a cutoff date for sample submission. While there is no cutoff date at this time, the researchers are extremely eager to have DNA evaluation of these 4 breed associated conditions underway. In fact, they are hoping to be able to have at least some preliminary results as early as August, and definitely before National. In order to do this, they must receive the needed number of samples very soon. The faster we get Doberman samples in to them, the faster research can progress. So please contact them TODAY to request your free submission kit. Please collect your sample(s) and get them on their way to the Institutes ASAP! Once I learn the number of samples already received for each disease I will report that information. In the meantime remember, YOUR dog's sample is important. Also, the greater the number of samples, the greater the accuracy of research results. Lastly, keep in mind- the funding (your taxpayer dollars at work) is presently there for this research- once it is used and gone, it is gone. So let's please avail ourselves of this wonderful opportunity to help our breed, now! 3. Re: samples from DOGS WITH CANCER, there is a new development. Many dogs of many breeds are affected by lymphoma and osteosarcoma but *relatively* fewer suffer from MELANOMA. In order for a dog breed to be selected as a model for study of a particular type of cancer, thus to *go to the top of the line in terms of study*, a minimum of 25 saliva samples (or blood *if* possible) from affected dogs of that breed are needed. We are already on our way to the original 10 sample requested. Eligible dogs can have malignant or benign melanoma, and they can have had melanoma in the past but been successfully treated for same and not presently have cancer. 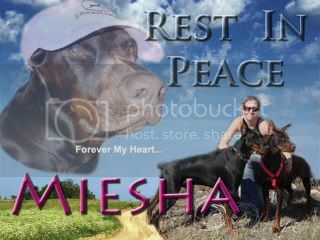 If your Doberman has or ever has had melanoma, Please submit a sample on him or her now. 4. Many Dobe owners whose dogs donated blood in the past to our DNA blood bank have already been in touch w/ Mr. Dziuk w/ OFA as requested to update their donor dog's health status. He asks that anyone who has not yet done so, please contact him now at [email protected] Thank you. Just seeing this today.....I will do it too. Rah's sample went in the mail this past week! My osteo dog Priscilla is in Canada, usually that is a problem....sigh...but I will contact her. Just talked to Elissa on the phone-she's sending kits to me this week for Razzle (CAH) and Connor, who's going to be a control dog. I'm going to send a link to this message to Dragonman, whose boy Drago also has liver disease. I think we have at least one other person on this board whose dog has CAH, I hope they also will participate, as will anyone else whose dog has DCM, CVI, or cancer. Last edited by Murreydobe; 06-28-2010 at 10:18 AM. Dogs Name: Am/Can CH Starlaine Wild Wild West "Mariah"; Dragonheart 'N Starlaine The Gunslinger "Victor"
Hmm just saw this. I will call tomorrow about Drago's inclusion in the liver disease trial. He has his DNA at OFA as well but I can get a sample drawn if necessary. Can Ch Dragonheart's Mighty Dragon CGC WAC "Drago"
Am/Can Ch Starlaine Wild Wild West CGC "Mariah"
Dragonheart 'N Starlaine The Gunslinger "Victor"
I am so excited about this research. My last boy passed of CAH (he was also occult DCM). The other person that I know of on this board is Dobes4us. I will send her a PM to this thread. Last edited by Dobesanddragons; 07-07-2010 at 02:16 AM. The little Blue Girl has been adopted so we no longer have her, but do they need control dogs? I would be glad to send a kit in from Tango? They told me they would love to have samples from my dogs - maybe as controls?. I received my package yesterday. Well Drago has a recheck for his liver disease this morning actually. So I've got the paperwork to submit him with a blood draw today. I'm always happy to help future successful research on doberman health. I hope they find something. My kits are ready for me to take to the PO today.